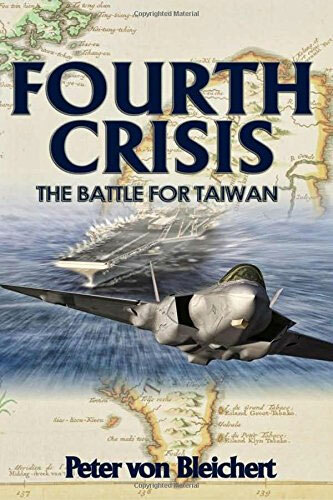 Fourth Crisis: The Battle for Taiwan is a military techno-thriller by Peter von Bleichert. The story does not follow the adventures of one person, but does give the slight majority of attention to U.S. Navy Lieutenant Cynthia Pelletier. The Chinese government is divided into two factions: the militaristic faction and the peace faction. The militaristic faction wishes to attack Taiwan while the peace faction believes that the time has not arrived yet. A rogue Chinese general uses his network of underworld contacts and hackers to order Taiwanese military personnel to launch a full scale nuclear attack on China. The result is that the world is plunged into war again. China commences a full scale invasion of Taiwan and the United States intervenes due to their promise in 1979: "We will consider any effort to determine the future of Taiwan by other than peaceful means a threat to the peace and security of the Western Pacific area, and of grave concern to the United States." The war touches everyone's life. While the plot is very well developed, the technical knowledge that Peter Von Bleichert shows really stands out. His technical accuracy of U.S. and Chinese military tactics and equipment is truly amazing. The book is suited for both teens and adults although it contains a good measure of violence. Fourth Crisis: The Battle For Taiwan brings you war like you have never experienced it before. It is incredibly fast-paced and places you right in the heart of the action. "We will consider any effort to determine the future of Taiwan by other than peaceful means a threat to the peace and security of the Western Pacific area, and of grave concern to the United States." Peter was born in New York City, has lived in Puerto Rico, Greece, and England, and currently resides in California. He connects with his readers on social media.